Have the same attitude toward all. Put away ambitious thoughts and associate with those who are lowly. Do not be wise in your own estimation. Times have always been difficult for the vast majority of the citizens of Louisiana since before and after it became a State in 1812. Those difficulties have only increased since the impacts of Hurricane Katrina and Rita in 2005 and Gustav and Ike in 2008. 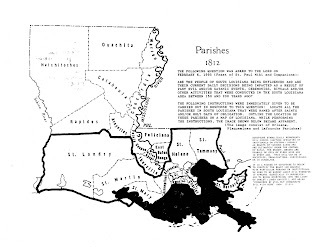 Additionally, being on the "centerstage of the world" from those two storms and through the wrongful actions of BP, due to its Deepwater Horizion actions, Louisiana now sits positioned to experience a mighty act of God working through an annointing placed upon this land called "Louisiana" and the "little ones" living on it acting faithfully and obediently to God. Of course, at the same time, the "little ones" have a particular grace AND obligation to respond. The future is not destined to be controlled from Washington and/or Baton Rouge but from the mighty throne of God in Heaven. We look to the Blessed Virgin Mary, first under the title of Our Lady of Prompt Succor, to lead us to Her Son and then to the Father. When the power of God moves, all will know it was indeed an Act of God. 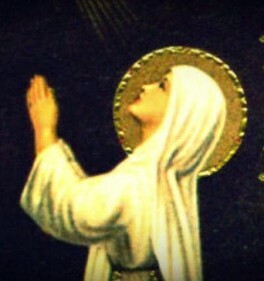 We should never forget She has many title but there is only one woman that we look to for intercession. Visit the Upper Room Prayer Cenacle in downtown Houma to celebrate Her. The great Marian canticle (Luke 1:46-50) “reveals in filigree,” as Pope Benedict XVI so beautifully teaches, “the spirituality of the biblical ‘anawim,’ that is, of those faithful who not only recognize themselves as ‘poor’ in the detachment from all idolatry of riches and power, but also in the profound humility of a heart emptied of the temptation to pride and open to the bursting in of the divine saving grace." Pope Benedict's General Audience can be found here. It was reported by CBS News on June 16, 2010 that BP's Chairman Carl-Henric Svanberg identified the Gulf of Mexico coastal residents as the "small people". 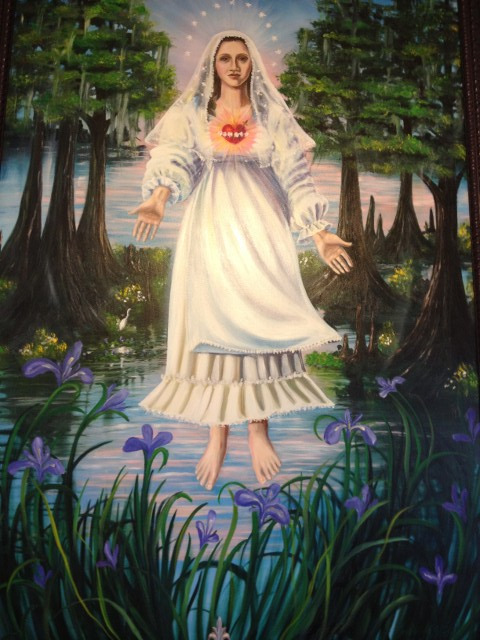 If one seriously considers the role of the "Anawim" in God's plan, this could be taken as a compliment rather than an insult and is in-fact claimed as such by many Catholics in Louisiana that understand that in order to follow Our Lady to a closer relationship with Her Son and with The Father one must indeed be "small". 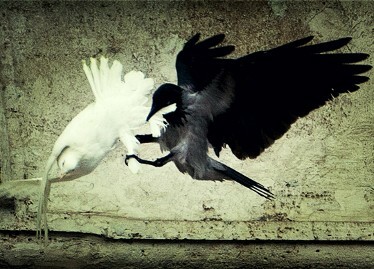 The battle of good against evil is often expressed as light against darkness. That imagery was formally declared in picture form for all to see over 200 years ago when Louisiana became a state (see below). The battle lines were then clearly depicted by the boundaries of certain parishes of our state many years ago. Each side was therefore identfied by the symbol that it represented it. "The Light" versus the darkness. Good versus evil. The sacrifical pelican with its blood stained breast versus the dragon, the beast, the serpent, the accuser of the brethren. The battle has been declared since the Book of Genesis. 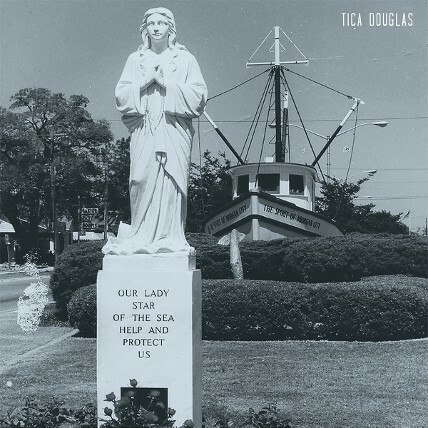 Inspired by St. Louis the IX and St. Joan of Arc and to in part engage the enemy on the battleline, the Louisianawim began to pray the last decade called the Sixth Glorious Mystery on May 17th, 1998 specifically to declare and plead that "The Light" shall hasten His return into the darkness of this world. (As one would expect, in South Louisiana, this decade is now often referred to as "The Lagniappe Decade".) It is the last step of the Redemptive Process and through the Rosary we pray for His speedy return! The State of Louisian formally began in 1812 and from the first moment of its being it was meant to be a unique part of the Church's offspring that was destined to wage ongoing spiritual war against the devil and his demons. A "boot" for Our Lady to wear! That little "heel" can be used in the power of Jesus to crush the head of satan forever (Genesis 3:15). A land that is in fact signified by the mother pelican in blood feeding her young! We have been given eyes to see things such as this! In connection with the above, click here to listen to Deacon Paul Birdsall from Christ the Redeemer Catholic Church in Thibodaux, LA present a 3-part series titled, "Invisible Servants" on Angels and Demons and Spiritual Warfare. We, the people of Louisiana, grateful to Almighty God for the civil, political, economic, and religious liberties we enjoy, and desiring to protect individual rights to life, liberty, and property; afford opportunity for the fullest development of the individual; assure equality of rights; promote the health, safety, education, and welfare of the people; maintain a representative and orderly government; ensure domestic tranquility; provide for the common defense; and secure the blessings of freedom and justice to ourselves and our posterity, do ordain and establish this constitution. As stated elsewhere in this website, this site is simply an attempt to bring together the Louisianawim so as to assist in the mighty work of God...which has began many ages ago! WE ARE A REMNANT CHURCH IN BATTLE! WHAT IS THE REMANT CHURCH TO DO IN THESE DAYS? Again, if you want more on what Archbishop Sheen speaks of, click here to listen to Deacon Paul Birdsall from Christ the Redeemer Catholic Church in Thibodaux, LA present a 3-part series titled, "Invisible Servants" on Angels and Demons and Spiritual Warfare. All the rich among the people shall supplicate thy face from age to age, and particularly at the end of the world; that is to say, the greatest Saints, the souls richest in graces and virtues, shall be the most assiduous in praying to our Blessed Lady, and in having her always present as their perfect model to imitate, and their powerful aid to give them succor. "Let us ask the Lord to grant us one very special grace—to love Our Lady, especially through all the work we do for Jesus, with Jesus, and to Jesus. We must ask him to deepen our love for Mary, making it more personal and intimate. We want to: Love her as he loved her. Be a cause of joy to her as he was. Keep close to her as he did. Share everything with her, even the cross, as he did when she stood near the cross on Calvary. We must love her unconditionally, trust her fully, abandon ourselves to her totally and without reserve. Nothing is impossible for those who call Mary their mother. During the day, let us often raise our hearts to her and ask her how we can love God as she loved him, that we, too, can love him with her heart."